Although solid state drives aren't as pricy as they used to be, they're still considered somewhat of a luxury. With some success, manufacturers have attempted to bridge the gap between flash drives and mechanical storage with hybrid solutions such as Intel's Smart Response Technology and Seagate's Momentus XT drives. Determined to show its rivals how it's done, Crucial has entered the arena with a slightly unique contender that makes it easier to boost the performance of your sluggish hard drive. 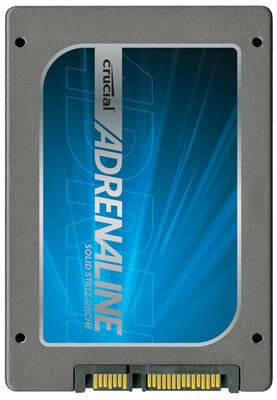 The company's new "Adrenaline Solid State Cache" package contains a 50GB m4 SSD, a 3.5-inch adapter and software that caches your most frequently access data. The beauty of this setup is that it doesn't require you to purchase anything other than Adrenaline kit to boost the performance of your existing hard drive. By comparison, the Intel's offering requries an SRT-ready chipset to link cache and storage drives, while the Momentus XT is more of a replacement hard drive with extra cache. To configure the cache drive, you only have to connect the m4 to your motherboard and power source then boot your machine and install the caching software to link your flash and mechanical drives. The caching application is fully automated, runs in the background and requires no user management, according to Crucial. We haven't seen pricing details, but the m4 occupies the budget end of the market with a 64GB model costing about $110 or $1.72 per gigabyte, about as cheap as you'll find for such a unit. With that in mind, we're hoping the Adrenaline kit is under $90.